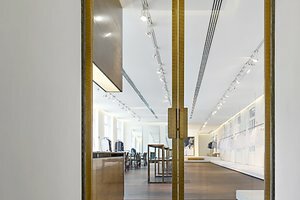 Situated in the heart of Zona Tortona, this space is perfect for the Milan Design Week “Fuorisalone” and can accommodate a Fashion Showroom, Private Sale or Product Launch. With large windows lining the length of this space, there is a bright and luminous atmosphere. 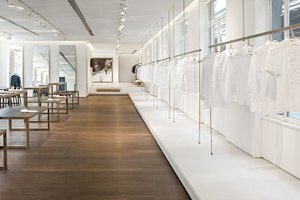 The interior is pristine and tasteful with white walls and ceilings, dark wooden floors and rows of track lighting, perfect for displaying clothes and product. 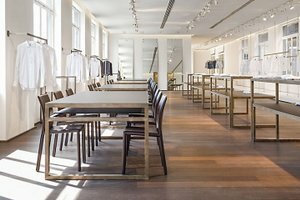 Amenities here are extensive and include garment racks, internet, furniture, office equipment and more, making it a wonderful option for a variety of showroom needs. Located in one of Tortona’s most recognizable buildings, this space has great atmosphere and is perfect for many different Design Week events.